Four-hundred Midland employees will be hoping to smash company targets of a different kind – when they take on the Simplyhealth Great Birmingham 10K challenge on Sunday. 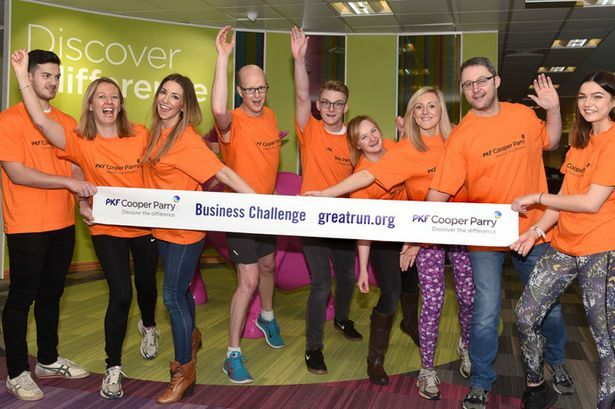 Thirty teams from firms of all sizes, and featuring runners of all abilities, are competing in the Great Birmingham 10K PKF Cooper Parry Business Challenge – the event’s biggest business challenge yet. Trophies are handed out to the fastest teams – with the four fastest collective times by participants added up for each team to pick the overall winners. In addition, any company that enters 12 employees or more receives its own engraved plaque in the name of the fastest runner in the team. Among the companies taking part in the 10K Business Challenge is Wolverhampton-based Charter Court Financial Services, which has amassed an incredible 50-strong running team. And Business Challenge sponsors, accountancy practice PKF Cooper Parry, will also have a team of 21 on the Jennens Road start-line. These two teams will be competing against the likes of Town Hall Symphony Hall, the BBC, commercial property agency CBRE, Vodafone and law firm St Philips Chambers. Entry to the 10K Business challenge is now closed, but you can enter your company in the Simplyhealth Great Birmingham Run Half Marathon Business Challenge. It&apos;s on the same day as the inaugural Birmingham International Marathon. Ade Cheatham, chief executive of PKF Cooper Parry, said: “As proud sponsor of this year’s Great Birmingham 10k Business Challenge we would like to wish all the teams taking part, including our own runners from PKF Cooper Parry, the very best of luck for the race on Sunday. Almost 8,000 people are expected to take part in this year’s Great Birmingham 10k on Sunday, April 30. The 10K is accessible to all levels of ability, whether you walk, jog or run the route and is also a great training run in preparation for the Simplyhealth Great Birmingham Run half marathon or the inaugural Birmingham International Marathon to be held in the city in October. This year’s 10K features the Commonwealth Games challenge, which is aiming to highlight Birmingham’s bid to host the Commonwealth Games in 2026. It&apos;s easy to enter the Great Birmingham Run Business Challenge on October 15 (the same day as the inaugural Birmingham International Marathon).